Lip crayons are the crazy thing for now! Even the French Brand Yves Rocher took the plunge and created something unique! Instead of the usual Matte Lip Crayons you see recently popping out in the market, they created Radiant Lip Crayons. I got 5 shades to work with for 5 different work days and here are the shades at a glance! What's your top pick? What's your least favorite? "Moisturizes and sublimates lips.Make your smile even more beautiful with the Radiant Lip Crayon. Its moisturizing texture melts on your lips, enhancing them with radiant colour. Shades may be applied on their own for solid colour or two at a time for a trendy “tie-dye” effect. Result: Moisturized, radiant and subtly tinted lips. The Plus: With its retractable tip, the Radiant Lip Crayon never needs sharpening! Paraben free." These lip crayons are housed in a color-coordinated tube (same color of tube as the crayon color). These babies don't need to be sharpen, all you need to do is to twist up and down. Now, please do not expect these to be similar as matte lip crayons available in the market nowadays. The formulation of these crayons are entirely different! 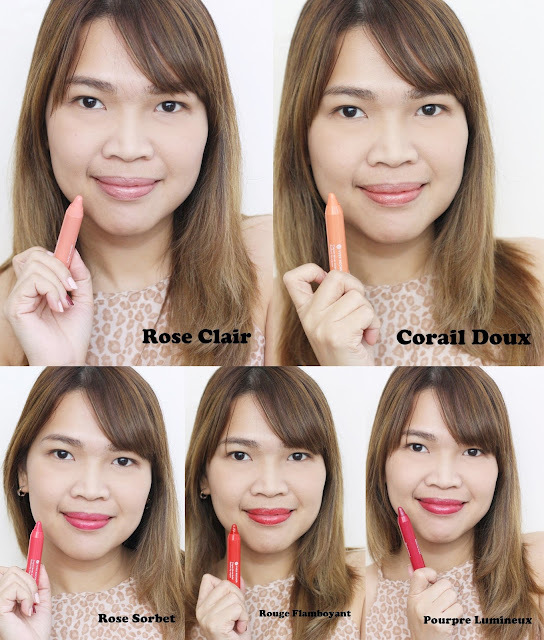 They are called Radiant Lip Crayon for a purpose, they glide on easily, gives a natural shine on lips and gives a slight stain to lighter shades and a bit of tint for darker shades. I am not sure how many shades in total they release but I got all 5 shades available in the local market. First 2 swatches from Left, I need to apply 3-4 coats to make the shade appear more visible. The rest of the colors around 2-3 coats. Rose Clair, as the name "clair" states, I do expect this to work like a regular lip gloss with a hint of "rosy glow". This shade would look really pretty on users with light colored lips! For me, I may need to use a lip concealer to create that "rosy glow" that I may want to achieve. I personally thing this is a nice shade to use on top of a lipcolor underneath. Same as Rose Clair but this one has more peach tone to it, this is another lip color that wouldn't work well on heavily pigmented lips. As much as I liked how it looks on photo, I had to apply and reapply so many times to achieve this color which I think I can achieve using other brands! Again, this is a lovely color if user is young, or wanted something really subtle. A light to medium rosy pink color that can immediately create a younger vibe! I like how this 3rd color brings out more color on my lips. This is a cool-tone pink color. My least favorite just because it has an orange red tone to it, it's not you Yves Rocher, it's me! :) This color would work so well on users with medium to darker complexion! I like the pigmentation and love the extra shine it gives. But the color just does not work for me. This particular shade is my favorite out of the 5. It is a deep cool-tone mauve pink with a tiny bit of silver sparkles. I love how it can give color to my pale features. This is a perfect color for girls who want to transition from wearing lip tints or lip balms to a deeper shade. I consider Yves Rocher Radiant Lip Crayons as a moisturizing Tinted Lip Balm-type of crayons. I like how the color remains on lips around 2-3 hours until reapplication and how it feels light and hydrating on lips. All the shades I wore are great for daily use. I consider these a wonderful starter lipsticks for people who aren't into heavy makeup. For professional makeup artists like myself, I would call these my "extra boost" of color, shine and hydration on top of a drying lipstick. Which among the 5 shades featured would you like to own?